There was frost on the ground when I was waiting for the sun to rise. I wasn’t alone. A few other nutjobs were scattered about, standing in the dark and cold, all pointed toward the mountains. We were waiting for magic. Jeremy was in the car either reading a scientific paper or getting some shut eye. Shivering in the blue glow of twilight, I moved my feet in a silly little dance to keep warm. But, I do like sunrise shoots better than sunset shoots. Mornings tend to be quiet, thoughtful. By sunset, I’m usually tired, hungry, hot, dusty, and smelly. Sunset requires a little more discipline to remain inspired. 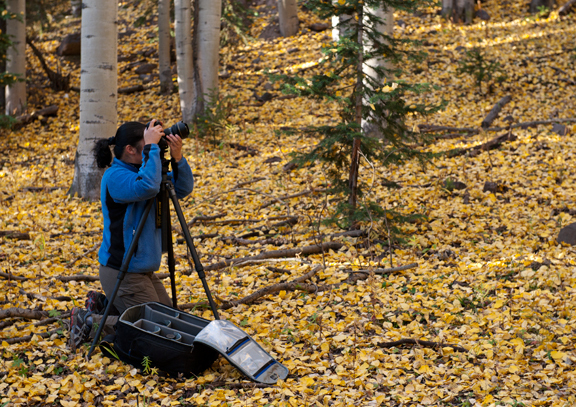 On this last shoot, Jeremy accompanied me for the 1000-mile drive around southwestern Colorado. This is my fifth year shooting the fall colors in Colorado and I think I’m starting to get the hang of it. I know the location of remote favorite stands of aspen better than how to get to most of my friends’ houses in town. 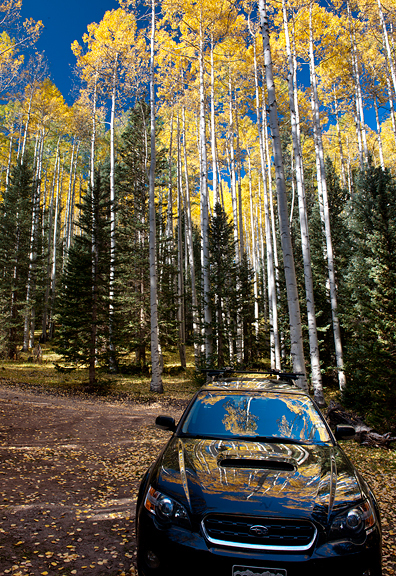 The aspens feel like old friends. 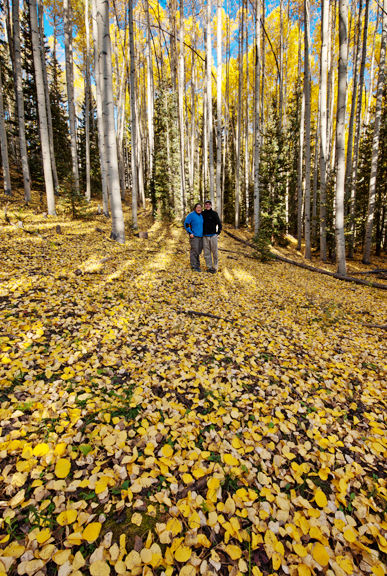 There is something to be said for the tranquility you find among mature aspens – majestic white trunks, shimmering yellow and red canopy, gold leaves gently floating down around you. Autumn delights and soothes. And winter is just around the corner. 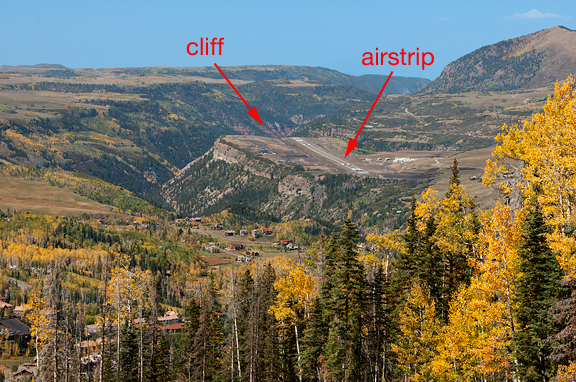 On our way back, we spied the Telluride airstrip. Jason wasn’t kidding when he told me it’s a cliff. As far as my schedule goes, the fall shoot is done. Stick a fork in it! I have my sights set further west for the next couple of months and then hopefully by then it will be cold enough to start cooking again – I mean really cooking. But if you want a quick baking project that doesn’t turn the entire house into a furnace, might I suggest trying homemade crackers? They are so unbelievably quick and easy, and of course they taste better than any store-bought cracker. How is it that we don’t all make our own? There ought to be a revolution. The greatest hurdle to finally making my own crackers was deciding on a flavor. I knew I wanted it to be savory, so that helped to narrow down my choices a little bit. Ultimately the winner was a baconized version of a New York Times Parmesan cream cracker. Well, I made both versions – one with and one without the bacon in the off chance the bacon cracker didn’t turn out to my liking. Off chance, ha! 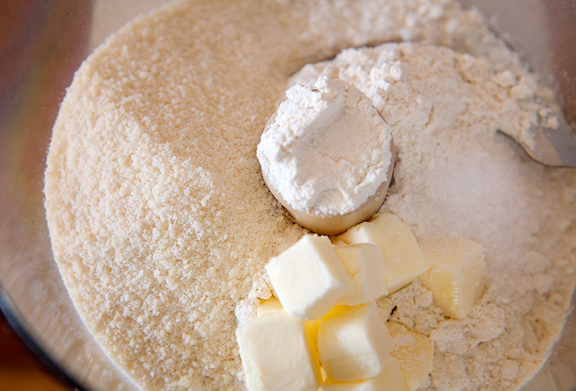 Even without a food processor, it only takes a few minutes to cut the butter up into the dry ingredients and wet it down with some cream. As for rolling the dough, I have become a big fan of rolling dough out between sheets of parchment or plastic wrap. 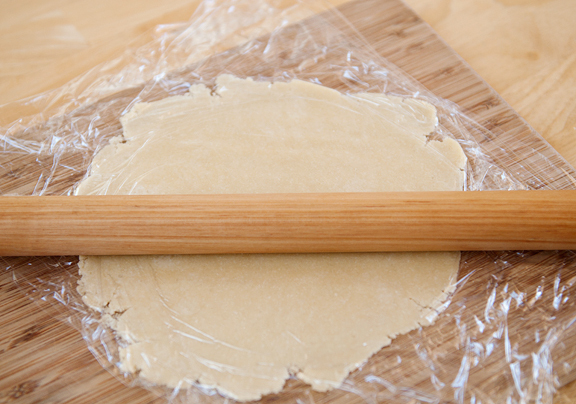 Not only is it less messy, but it makes transferring the rolled out dough a snap. Once the dough is rolled out, the fun part is scoring it. So that’s what those fancy pastry cutter wheels are for! Isn’t it established fact that foods cut into cute little shapes actually taste better? I don’t own one of those dealie jobs, but a sharp knife works beautifully if you like straight lines. 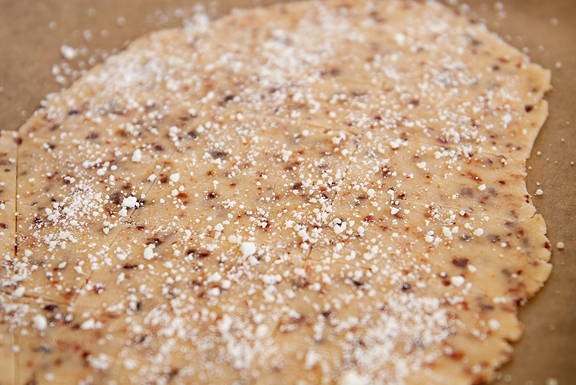 You will want to watch the baking time because the edges brown quickly. Be careful with these crackers because if you don’t pay attention, you just might polish them off in one sitting. I didn’t even think to eat them with anything, just straight up. Fabulous. Oven: 400°F. Line a baking sheet with parchment paper and set aside. 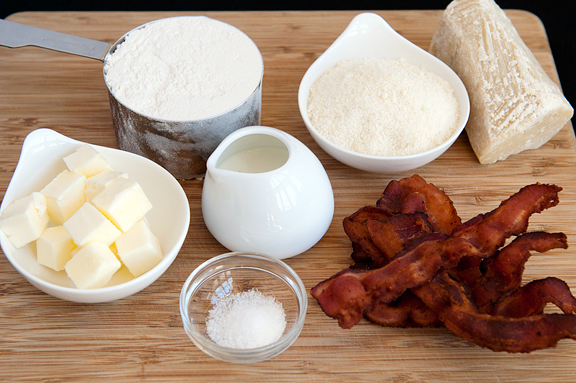 Place flour, salt, cheese, bacon, and butter in food processor. Pulse until everything is just combined. 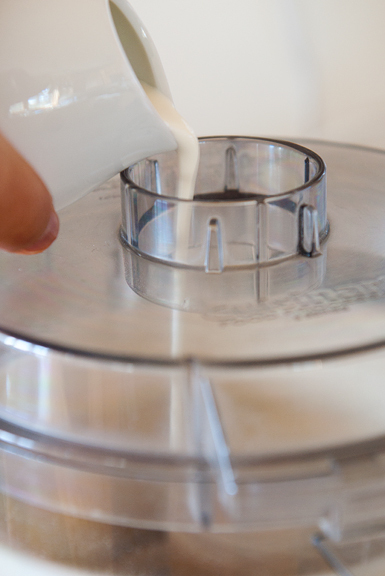 Pour the cream into the food processor and pulse to combine. 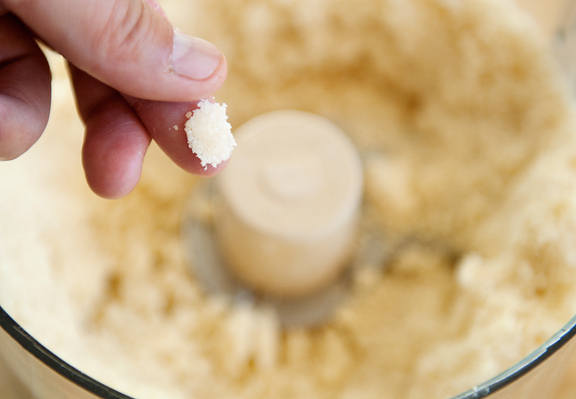 Add more cream a teaspoon at a time until the dough holds together but isn’t wet and sticky. 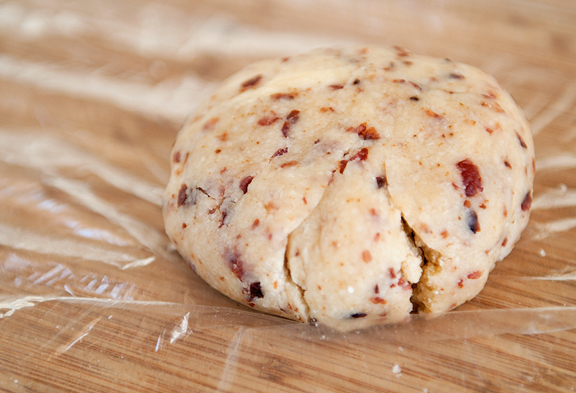 Roll the dough out between two sheets of parchment paper (or wax paper or plastic wrap) until it is 1/2-inch thick or thinner if you prefer. 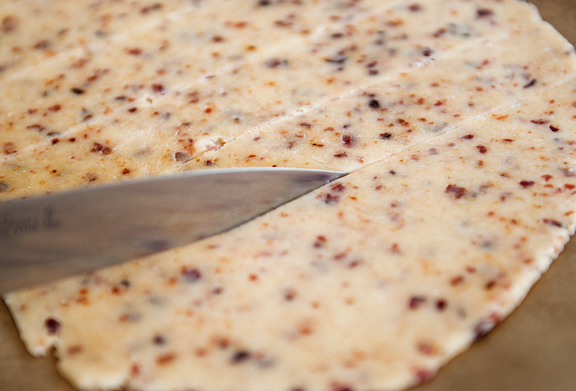 Peel one sheet of paper or wrap from one side and place the dough on the prepared baking sheet. Peel the remaining sheet of paper or wrap. Score the dough with something sharp (knife, pizza cutter, etc.). Sprinkle with salt or whatever tickles your fancy. Bake for 10 minutes or until golden. Serves 4-8. I love the photo of the moon. That’s spectacular. Hope you have more of a ski season than you did last year! I love crackers, but I hate making them at home because they invariably lose their crispiness within a couple of days (even though I store them in an air tight container). Any tips on how to make them last longer? Oh yum. These look seriously delicious. I drove around that area of Colorado (Telluride area) in the spring, and it was one of the most beautiful places I’ve ever seen. Thanks for sharing these pictures. Chaitali, store them in a tin, not in an air tight container, lined with parchment paper. Chaitali, I collect the dessicant packages that come with vitamins, seaweed snacks, etc. and I put them in the container with my crackers and that helps a lot. You can also put your baked stuff in fridge (which slows the staling process down a little) or briefly toast it (which freshens the taste) before eating. But basically, fresh, homemade baked goods are just that. They taste much better than store-bought but they don’t last, and that’s what makes them special. It’s like the difference between the soft, fragrant tomatoes grown in ones backyard and the hard, flavorless ones from the big-chain supermarket. Same item, but a different quality, and used in different contexts. You had me at bacon. Pig: The only animal you can feed apples and get bacon. I love those kinds of airtrips! I’ll blame my sister for that, she loves airplanes and flying (she has yet to extend her license to mountain landing so she can’t land on that airstrip) and that means that whenever we go skiing, she’ll talk about mountain airstrips for ages! Wow! Those crackers look amazing! I think I had saved the New York Times recipe, but I had forgotten about it. Thanks for the reminder, and for the great idea of adding bacon! What do you think about freezing these after the rolling and cutting stage? I would like to make them for my daughters wedding and that is the only way I can imagine that I would be able to make enough just a day or two before the wedding. Mornings are nice, and so is that white cream container — where did you get it? These look so good!I love your photos and am happy I found your blog. We have a time share in T-Ride that I cling to with every last freakin’ penny. Hubs keeps saying we might need to sell it. Hope not. Your photos and experiences are a joy to read as always. This is definitely the best thing I’ve seen all day. It’s like a hyped-up Southern cheese straw! Anyway other fun things you can do with the dough is cut them into strips to make cheese sticks or cut them with a cookie cutter to make pretty shapes. Beautiful pictures. I just love the one with the moon. So nice. 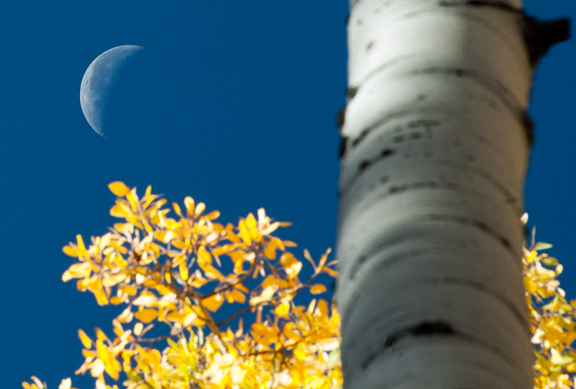 I’m a moon person (sounds nutty), but I could just gaze at the stars and moon all night long. Never made homemade crackers before but I am sure they are delicious! wow wow wow… beautiful pics jen! the moon and token pic.. are just awesome! Mmm these sound scrumptious! I love the Subaru add too. Too cute! Great fall pictures. Love Telluride! The bacon ones look spectacular! I’d need to keep them buried riiiiiiigght at the back of my pantry otherwise I’d polish them all in a matter of mere minutes. I shivered when I looked at the photos of the trees, my heart literally ached to be able to walk in a forest. I live in a desert! Ah well have to make the best of a beach at the end of the street, blue skies and warmth….I keep reminding myself! Better make some crackers for restorative calm – these look great. Really enjoyed this post. Fabulous photos! Your token photo is most endearing. I so enjoy your blog! Fabulous crackers! You live in an awesome place. Is that airstrip for REAL? Yikes. Crackers make my mouth water……. These crackers are a wonderful idea, Jen! Yum! It looks like you got some great autumnal pictures! I think the driving was probably worth it. Ok, so I made these. I decided to take some liberties with it, because I am REALLY low on cash so I have to work with things I already have. I couldn’t get bacon or parmesan, but I had a wheel of aged white cheddar, so I used that instead. The crackers taste DELICIOUS! I love the taste and the texture. One thing to mention is they are more like Pie crust crackers. And well, the recipe is basically pie crust, so it makes sense. Therefore, no matter how thin you roll them or how long you bake them, they aren’t the kind of cracker that work out well for thick dips or scooping. Keep that in mind when making them for a party. Also, when made with cheddar they taste like goldfish but so much better. :-P So, for those that want a gourmet goldfish- use aged white cheddar! Beautiful Fall shots! 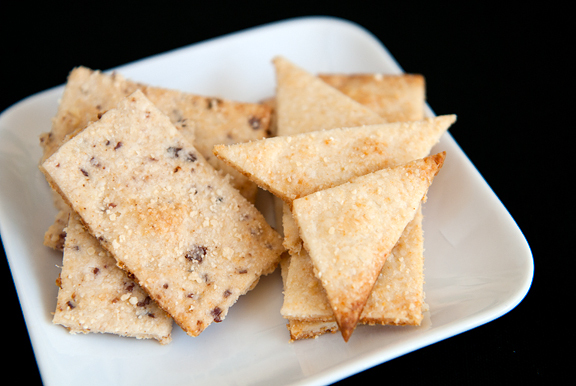 Your crackers look deliciously flaky–this is definitely a snack I couldn’t resist! You’re not fooling anyone, you know. I’m totally sure these really only serve 2 peopkle, one if that person is selfish. They sound that delicious. Spellbound, what a gorgeous pictures! and delicious crackers! Crackers? Why have I never thought of making my own crackers?? 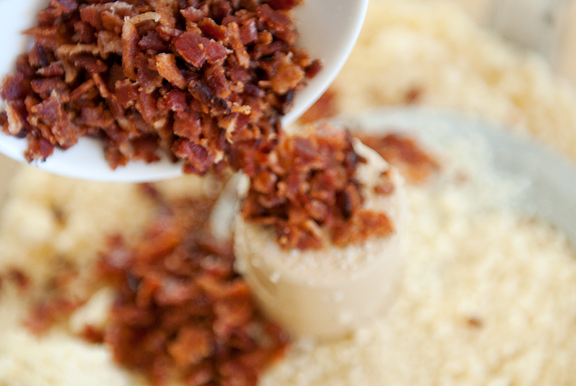 Those look amazing, and adding bacon to just about anything is a great idea. Thank you for the post! Chaitali – well, I imagine layering them between parchment and storing in a sealed container helps. Ours lasted a good while, but our humidity is ridiculously low here. They won’t last as long as store-bought crackers – no preservatives. Amy – nice tip, thanks! Sindy – well, I think it would work, but if it’s for a wedding, I’d try to freeze a small batch ahead of time and then bake to see how they compare. Good luck! Heather – I’m pretty sure I got it at Crate and Barrel for a few bucks :) Cute, isn’t it? Kay – Crate and Barrel :) Just a few bucks, but I thought it was so cute :) It’s quite tiny though. Betalutti – if I had the time, sure – but I don’t :( Maybe when my gallery is overhauled at the end of the year? Bug – yay! I’m glad the recipe is so versatile. I have made this many times – always with the addition of fresh chopped rosemary – it comes out amazing – the bowl is always empty and I usually make double the recipe!